Sapwood Cellars made took several massive steps in April! The big news was that we received our Federal Brewer’s Notice from the TTB! It turned out that it wasn’t too difficult. For example, they didn’t take issue with the drawings we submitted simply having an area designated for brewing without an equipment layout. The Brewer’s Notice is the last piece of the puzzle for our Maryland Class 5 license (other than an inspection). We also completed our local liquor license application including being fingerprinted. There will be a hearing in front of the liquor board in the next month or two if everything is in order. Once we get that, we will allow us to sell pints (and tulips) in the tasting room. Nearly as exciting, our 10 bbl Forgeworks brewhouse arrived! To save a little money we had the truck with our cold-side equipment (fermentors and brite tank) from Apex stop by Colorado to load-up the brewhouse. We also drove down to Manassas for a 15 bbl fermentor the day before from our friends at Sinistral Brewing. That made for a busy day for the riggers unloading and standing up all of the tanks. Our fathers both visited for a few weeks during April. Nice to have a little unpaid assistance meeting with contractors, building benches, receiving deliveries, and painting! 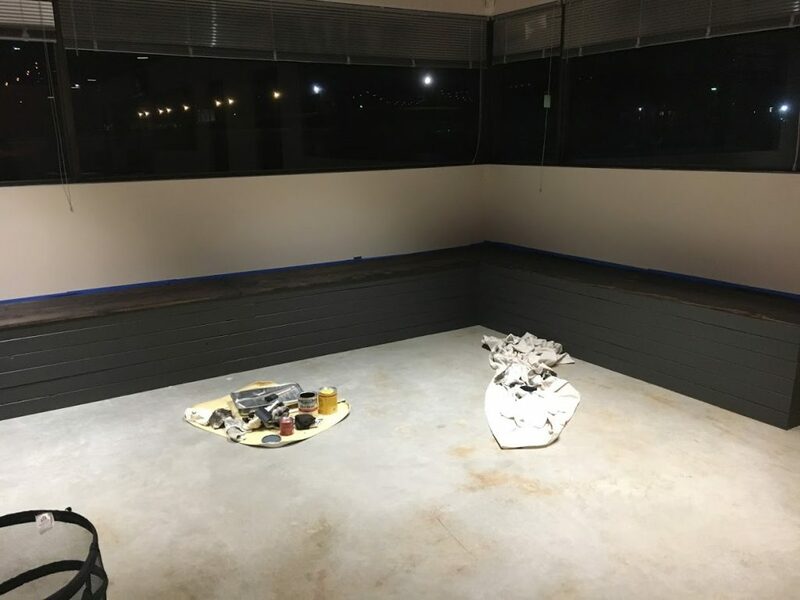 The tasting room is really coming together, and we’ve still got a few beautification projects planned! 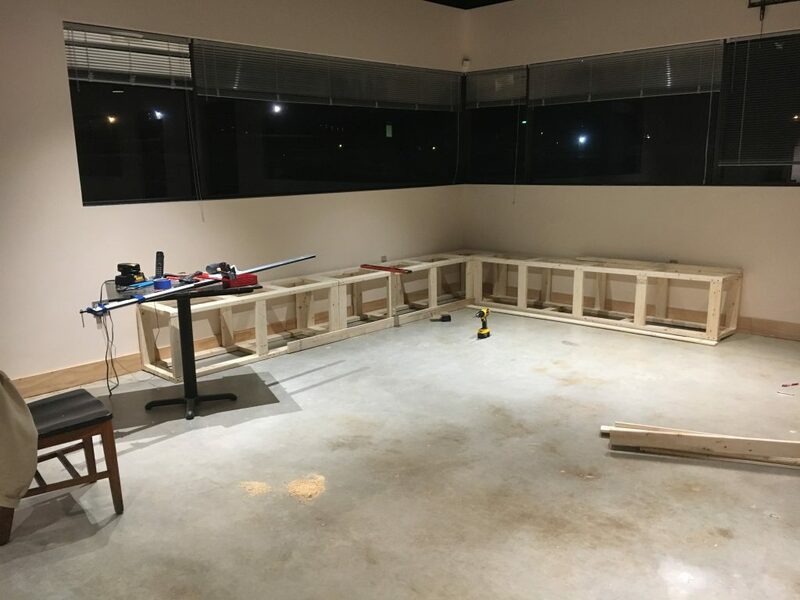 The start of a built in L-bench for the tasting room. After going back-and-forth a few times on whether we wanted to expand or modify the existing concrete pad, we decided to leave it as is. To protect the concrete from heat and chemicals we sealed it with a two-stage epoxy from Brew Floors. We started by grinding the concrete and cleaning it to make an ideal surface for the epoxy to adhere. The epoxy itself was relatively simple to apply, although the top-coat was so thick that it pulled off bristles from our brushes and a few tufts from the rollers provided. Your next opportunity to taste our test batches will be this Saturday (5/12) at the Maryland Craft Beer Festival in Frederick, MD. We’ll be pouring a new iteration of Cheater Hops: Citra-Galaxy. One keg is straight-up with big tropical juicy notes enhanced by Omega Farmhouse’s IPA Blend. The other half was infused with lemon zest and vanilla beans for a sherbet-IPA. We’ll also be pouring a new triple dry hopped Amarillo-Citra IPA fermented with Wyeast American Ale II. 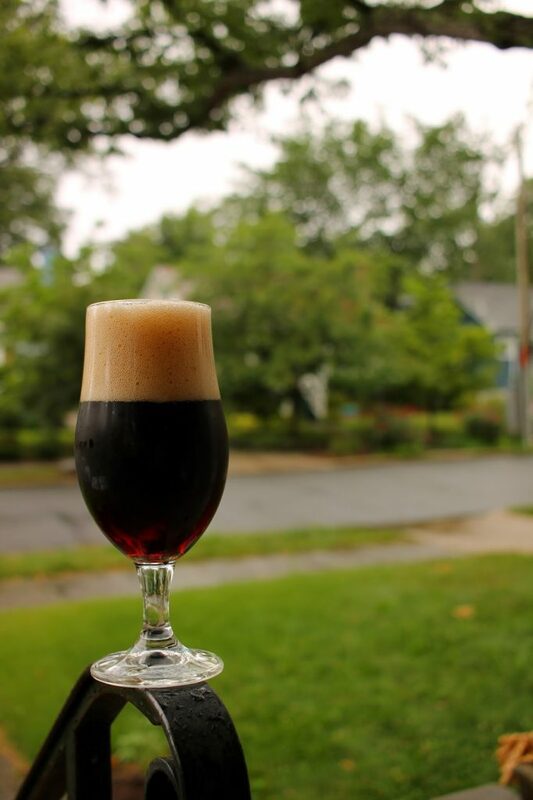 Finally, for our loyal mailing list subscribers and social media followers, we’ll have a request-only Funky Dark Saison with pomegranate molasses and date syrup! 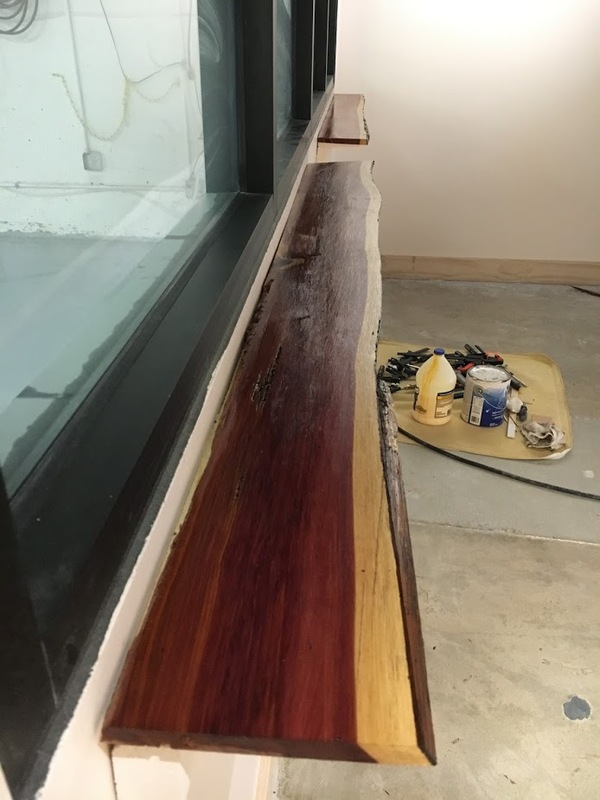 We made a drink ledge looking into the brewery out of a 420-year-old Red Cedar tree, look at all that sapwood! In May we hope to get significant progress on the last pieces of build-out: HVAC (glycol to chill our tanks), electric (to run our pumps), and plumbing for an in-line hot water heater and supply water to the brewing area. Looking more like August for opening at this point!